Our company was established to produce various casting pieces in Konya in 1987. Afterwards, our company which concentrated on brake drum production by combining new technics with the experiences gained in casting process owned Akkuşlar Co. Ltd. commercial title by incorporating in 1995. Our firm keeping up with the innovations added to the production brake disc mirrors which is a part of disc brake system thanks to the experiences gained in brake drum in order to provide better service for its countrywide and worldwide customers. We moved our factory to Busan Organized Industrial Zone at the beginning of 2000 and continued production for 7 years there. 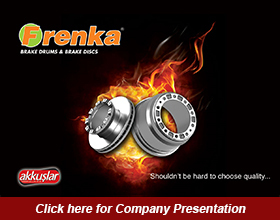 Branding was aimed through Frenka brand developed in 2007. At the beginning of 2008, the new factory construction in 37500 m² open area and 6000 m² closed area in Konya Organized Industrial Zone was finished and we moved there. Some machinery investment was made through renewing foundry, sandblast machine and cnc turning machines and so the capacity was increased. The manufacturing is still continuing here. Our firm which has united its expertise on casting and moulding processes with the innovations of modern technology possesses a manufacturing system to meet the needs of all types over 350 kinds of drums and discs in 30 main groups. We are selling 60% of manufacturing to domestic market through distributors. 40% of manufacturing is exported directly or indirectly. Most of the export is done to Middle East. There are such countries as UK, Ukraine, Russia, Azerbaijan, UAE, Saudi Arabia, Egypt, Iran, Iraq, Syria, Yemen, Algeria, Jordan, Sudan we export. Our company which makes a distinguished name for itself thanks to the quality of its products produces in compliance with European Standards and is on the way to become one of the best supplier in the sector in both domestic and foreign market. To become one of the best supplier in international market by completing the high technological investments. To work always for better quality without compromising from product quality and to effort our best in order that customer can have the best service and the product. To reply complaints and expectations quickly; to solve them; to supply customer satisfaction; to manufacture products which cover their needs.